This Home is in an equestrian theme gated residential community in Costa Rica. This private neighborhood is located in the foothills of the mountains on the central pacific coast just outside Quepos in the quaint town of Naranjito. We are far enough from town to enjoy the tranquility & peacefulness of the country, yet close enough to benefit from the necessities and luxuries of town. The Development is just 10 minutes from the Quepos airport and only 20 minutes from Manuel Antonio National Park and beach. The property encompasses 177 acres of lush green rolling hills and exotic native plants. We currently have 15 horses on the property for the use of the residents & their guests. The farm employs 10 full time workers and an on-site manager who work very hard to maintain the immaculate beauty of this amazing property. It has been said by locals to be the nicest and most beautiful development in Costa Rica. It is truly a magical place that must be experienced! The home is an entertainers show piece, with high ceilings and spacious rooms that open to a central infinity edge pool, bar and entertaining area. 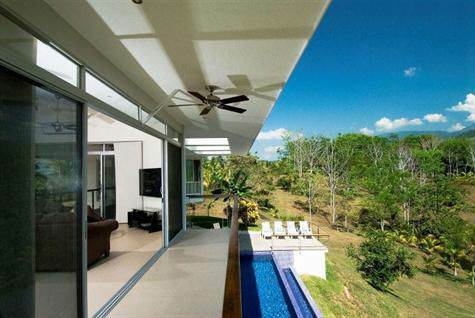 This home overlooks the developments center piece and in the back ground you can see the grand mountains of Costa Rica. The home is modern and completely up to date in a modern feel that blends with the rich coast lifestyle. The home has 3 large ensuites with terraces that look out to the different views available to this home. A 2nd story kitchen and family room that has some of the best nature views with open sliding doors and windows so you can enjoy the inside and outdoor living of Costa Rica.. Also this home comes with an additional apartment connected to the detached garage for guests or your house maids. This is a must see home of 4,386 Square feet on approximately 1 acre.